Pre-Engineered building accessories include everything that is not the foundation, structure, or roof. You can think of them as “customizing options.” We will consider some of them here, but this is by no means an exhaustive list. Once you get to work designing your building, you will no doubt find other available options that will help you personalize your new structure & have it compliment your existing buildings. Briefly touched upon on in the ‘Planning Guide’ section, there are a variety of different types of doors and door mechanisms available for use in framed openings. Sliding doors are one such economical large-door solution. 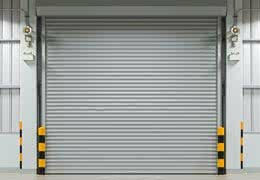 For certain applications, mechanized overhead doors (roll-up doors) are particularly convenient, especially when combined with a remote control system. several specialized door options are also available for aircraft hangers, see our door page here. 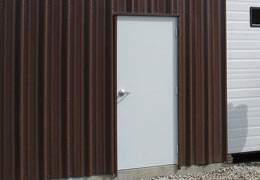 Necessary for most metal buildings, walk doors are typically self-framing, meaning that they can be installed anywhere they will not be blocked by column placement or by cable bracing. For this reason, you need not account for walk-doors when you are specifying the number of framed openings you want in your building. In selecting you walk-doors, half-glass doors may be chosen to let more light into the building. Windows provide a building with both light and ventilation, while also contributing to its ambiance and atmosphere. Like walk-doors, metal building systems windows are self-framing and field-located, so they can go anywhere that isn’t blocked by bracing or a column. Manufacturers typically offer both insulated (aka “thermal”) and un-insulated models, in a range of standard sizes. 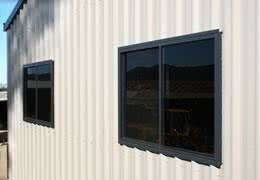 If you plan on heating and cooling your building, it pays, in the long run, to opt for thermal windows. Skylights are an excellent way to add natural light to a building, while also boosting its energy efficiency. In metal building systems, skylights are typically produced by substituting translucent fiberglass or polycarbonate panels for the steel roofing panels. Fiberglass panels are the most cost-effective, but polycarbonate panels are often used when something stronger than fiberglass is required. Some manufacturers call these “roof-lights.” Translucent panels can also replace some wall panels to produce “wall-lights.” Skylights are typically positioned on either side of the peak of the roof, which is why they are often sold in pairs. To get a sense of how many skylights to put in a building, manufacturers will look at the number of bays (spaces between frame columns) a building has and judge the optimal exposure from that. Ventilation minimizes condensation (very important in steel buildings), helps to keep the air in a building fresh, and plays a significant role in the regulation of temperature, keeping a building cool during the warmer seasons. To ensure sufficient ventilation throughout the entire structure, it is best to combine more than one type of ventilation device and move air between them, achieving what is known as cross-ventilation. 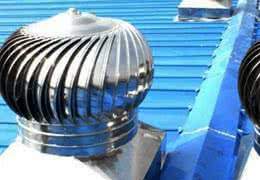 Some typical examples of ventilation systems components are wall, ridge, gravity, and turbine vents. Building manufacturers use formulas to calculate the amount of ventilation required given the size, structure, and function of a building, and they are happy to assist you in selecting the best device or combination of devices for your particular structure. Manufacturers offer a variety of colors to choose from for metal wall panels, roof panels and the trim that lines the edges of their buildings. Some also produce panels with acrylic stucco or simulated concrete finishes. 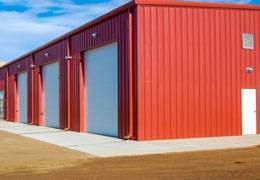 You can, of course, paint and finish your steel building yourself, although manufacturers do warrantee their coatings, surfaces and paint finishes as an added incentive for you to purchase components that have been pre-finished. Paint and finish warranties can range from years to decades, to as much as a half-century, depending on the finish grade. Unpainted panels coated with Galvalume (a zinc-aluminum coating), are typically warranted for up to 20 years. 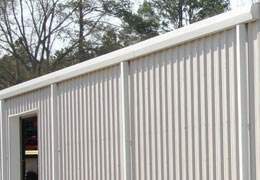 These types of finish are most common on Quonset hut buildings. If desired, professional finishes like wood paneling, stucco, brickwork, wainscoting, or masonry can be applied to make your steel building look like a regular wood-framed structure & blend in with your existing buildings. With a professionally- applied high-quality finish, the average person will be unable to tell that the building is pre-engineered steel. If you do decide to add your own aftermarket finish, general contractors can be hired to do this for you as well. Gutters keep the sides of a building clean and allow you control over the path of roof runoff so as to prevent the pooling of water around doors and parking areas. Like trim, gutters and downspouts contribute to the overall aesthetic of a building. 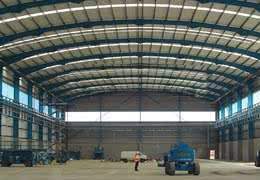 They are often used as the sole source of ventilation in very small steel buildings. Please note – gutters and downspouts are not required with the Arch style (Quonset) buildings, as the water naturally runs off the dome-shaped roof structure.